Usoskin, I.G., Hulot, G., Gallet, Y., Roth, R., Licht, A., Joos, F., Kovaltsov, G.A., Thebault, E. and Khokhlov, A. 2014. Evidence for distinct modes of solar activity. Astronomy and Astrophysics 562: L10, doi: 10.1051/0004-6361/201423391. According to Usoskin et al. (2014), the Sun "shows strong variability in its magnetic activity, from Grand minima to Grand maxima, but the nature of the variability is not fully understood, mostly because of the insufficient length of the directly observed solar activity records and of uncertainties related to long-term reconstructions." Now, however, in an attempt to overcome such uncertainties, in a Letter to the Editor published in the journal Astronomy and Astrophysics, Usoskin et al. "present the first fully adjustment-free physical reconstruction of solar activity" covering the past 3,000 years, which record allowed them "to study different modes of solar activity at an unprecedented level of detail." As illustrated in the figure below, the authors report there is "remarkable agreement" among the overlapping years of their reconstruction (solid black line) and the number of sunspots recorded from direct observations since 1610 (red line). Their reconstruction of solar activity also displays several "distinct features," including several "well-defined Grand minima of solar activity, ca. 770 BC, 350 BC, 680 AD, 1050 AD, 1310 AD, 1470 AD, and 1680 AD," as well as "the modern Grand maximum (which occurred during solar cycles 19-23, i.e., 1950-2009)," which they describe as "a rare or even unique event, in both magnitude and duration, in the past three millennia." Figure 1. 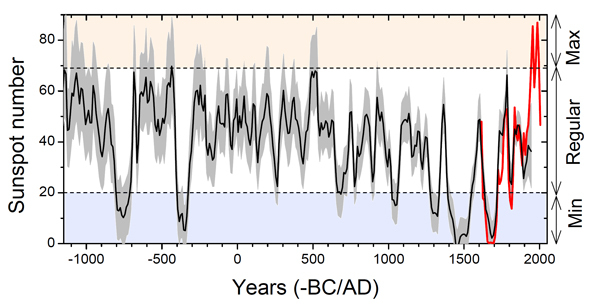 Reconstructed decadal average of sunspot numbers for the period 1150 BC-1950 AD (black line). The 95% confidence interval is shown by the gray shading and directly measured sunspot numbers are shown in red. The horizontal dashed lines demark the bounds of the three suggested modes (Grand Minimum, Regular, and Grand Maximum) as defined by Usoskin et al. Further statistical analysis of their reconstruction revealed the Sun operates in three distinct modes of activity - (1) a regular mode that "corresponds to moderate activity that varies in a relatively narrow band between sunspot numbers 20 and 67," (2) a Grand minimum mode of reduced solar activity that "cannot be explained by random fluctuations of the regular mode" and which "is confirmed at a high confidence level," and (3), a possible Grand maximum mode, but they say that "the low statistic does not allow us to firmly conclude on this, yet." Usoskin et al. (2014) write their results "provide important constraints for both dynamo models of Sun-like stars and investigations of possible solar influence on Earth's climate." They also illustrate the importance of improving the quality of such reconstructions, in light of the fact that previous reconstructions of this nature "did not reveal any clear signature of distinct modes" in solar activity. Unfortunately, it was beyond the scope of this paper to address the potential impact of solar activity on climate. Yet the reconstruction leaves a very big question unanswered -- What effect did the Grand maximum of solar activity that occurred between 1950 and 2009 have on Earth's climate? As a "unique" and "rare" event in terms of both magnitude and duration, one would think a lot more time and effort would be spent by the IPCC and others in answering that question. Instead, IPCC scientists have conducted relatively few studies of the Sun's influence on modern warming, assuming that the temperature influence of this rare and unique Grand maximum of solar activity, which has occurred only once in the past 3,000 years, is far inferior to the radiative power provided by the rising CO2 concentration of the Earth's atmosphere.